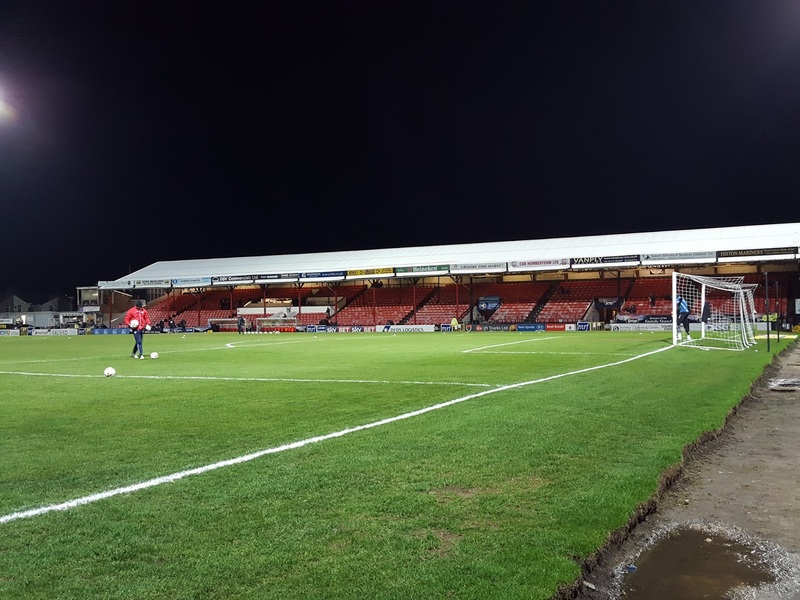 My second ground of 2017 was on Tuesday 28th February at Blundell Park in Cleethorpes, Lincolnshire. 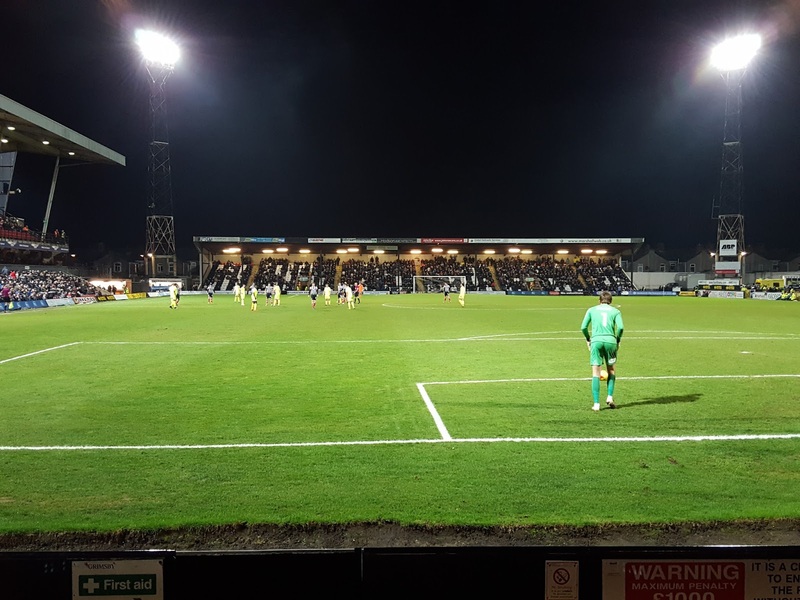 The match was Grimsby Town vs. Colchester United in Football League Two. 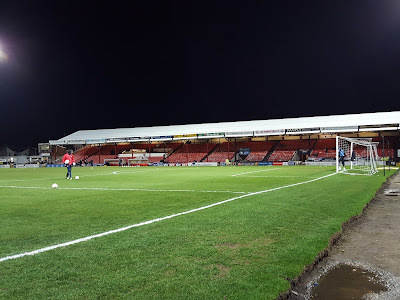 Blundell Park is carved out of a residential area around a mile south of Grimsby Docks with the ground a short distance from the Humber Estuary which leads out into the North Sea. A mile south of the ground is Cleethorpes railway station which is the nearest regularly served station. 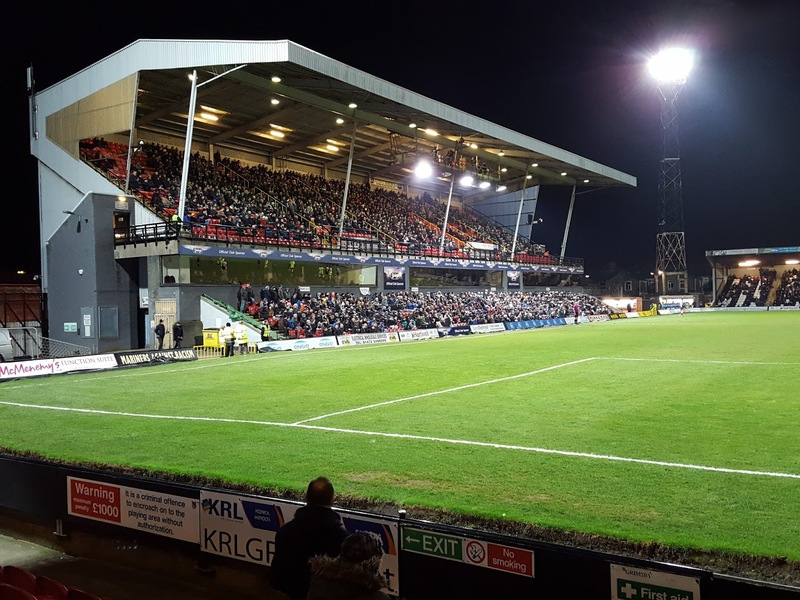 The club went through four stadiums in the first 21 years of existence but have remained at Blundell Park since it was opened in 1899. The Findus Stand (currently known as the Young's Stand) towers over the rest of the stadium with a top section consisting of just over 2,000 seats with a number of supporting beams at the front of the tier holding up the impressive roof. Directly underneath this seating are hospitality areas with windows facing out towards the pitch. Contained within the bowls of the stand are the boardroom, ticket office, club shop, a bar, a function suite and a restaurant. In front of the stand is an area which was once terracing but now has around 800 seats bolted into it. The seating areas only take up around half of the southern side of the ground with the remaining space currently unused for spectators. This was filled with temporary seating during the club's days in the 2nd tier but a drop down the leagues meant it was no longer required. The now unused space extends round the south-east corner up to the Osmond Stand behind the eastern goal. This stand is given over to away supporters and has a capacity of 1,900. The Osmond Stand is connected to the Main Stand by a quadrant which is also currently unused. The Main Stand runs two-thirds of the northern side of the ground. There are at least a dozen supporting beams holding up the roof at the front of the stand but as with the Osmond Stand the old design does mwan it retains sound well. This stand also has a concrete press box taking up an area near the centre with the two dugouts level with this. The north-west corner is another area not currently in so this just leaves the stand-alone Pontoon Stand behind the western goal. This stand houses the more vocal element of the home support and can hold close to 2,000 spectators. Colchester started the game well and came close to scoring in the 10th minute when Tarique Fosu let fly from 25 yards only to see his shot cannon back off the post. A quarter of an hour after this the visitors went within a few inches of goal again as a corner was played directly to Brennan Dickenson who shot just wide. Grimsby didn't spend much time in the U's area in the first half but a couple of minutes before the break were gifted a goal. With Colchester pushing forward Owen Garvan gave the ball away on the half-way line leaving a two-on-one situation at the back. Calum Dyson was able to go wide to beat Cameron James before squaring for Sam Jones to shoot over the line from four yards out. The hosts were tactically strong in the second half and bogged the visitors down in the middle third of the pitch. 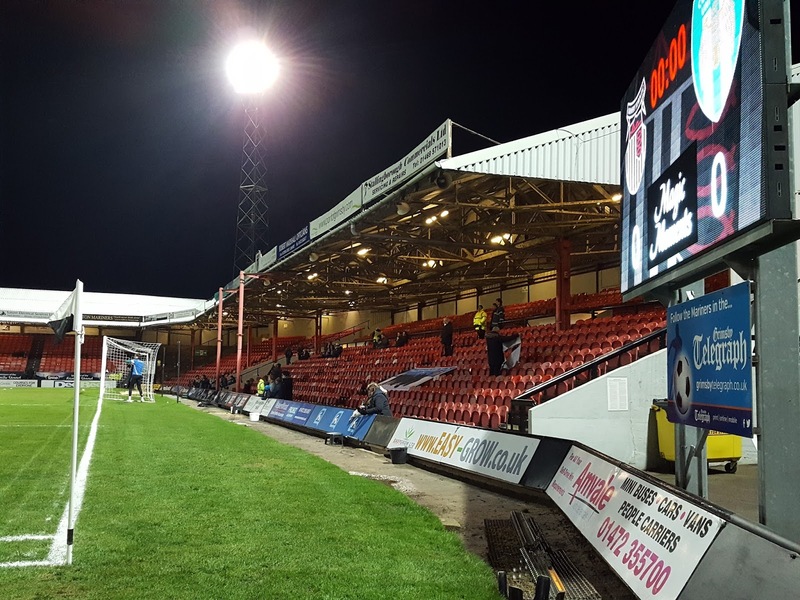 Colchester were rarely able to trouble Grimsby and were often limited to long-range efforts. The last few minutes saw a nervy period for the home side with a few scrambles in the box but they were able to see these out to record a one-goal victory.